We’d love to see further links with both local and global clubs and their academies; our players competing in the highest leagues post-university alongside excellent non-sporting careers; and also to continue expanding the Varsity Futsal event, always with the dream of it being hosted at an arena and being televised! Tonight in Nottingham an important fixture in the University Futsal calendar will take place and that is the Varsity Futsal event between the University of Nottingham Futsal Club (UoN) and Nottingham Trent University Futsal Club (NTU). Due to the hard work of both Universities, the event has attracted large audiences year on year and they are aiming to continue this trend at tonight’s event. Both clubs are describing the event as being historic for British futsal by potentially being the largest ever Futsal event in the U.K. University futsal is very important to the growth of the grassroots futsal community, the sport’s foundation and fan development. A part of the English FA Futsal strategy is developing Universities futsal further, selected Universities received funding to develop futsal programmes, especially for the women’s game. 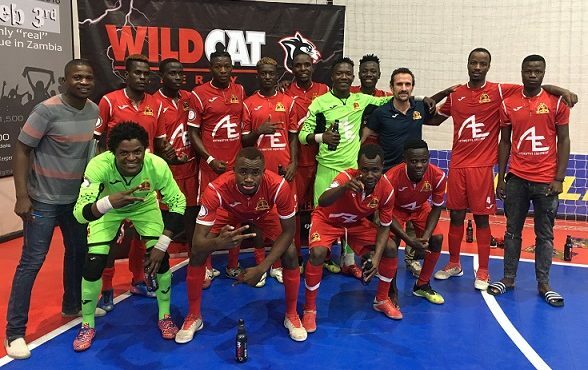 Futsal Focus has often wondered if futsal at universities in the U.K could be the first sport to take the step forward to replicate the American university sport fandom. Ahead of tonight’s event, Futsal Focus reached out to both Universities to find out more and spoke with Nottingham Trent University Head of Futsal David Tapia Owens and the University of Nottingham Head Futsal Coach Marc Forrest. For this interview, we are speaking with David as his club aim to win the Varsity event for the third year running. 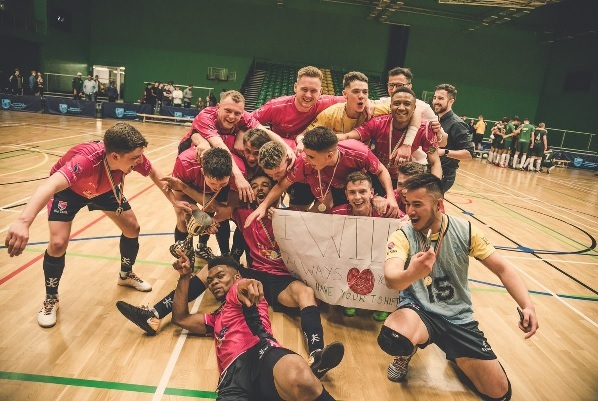 We were curious to start off by understanding the competitiveness between each club, how that rivalry drives each University’s Futsal Club’s development forward especially when Nottingham Trent University sees the great success their city rivals have enjoyed this season on and off the court. UoN has enjoyed great success this season, how would you describe your season and what have you learned from it? We’ve had a strange season this year and our successes have probably been overshadowed by the huge success over the previous two seasons of winning consecutive BUCS Premier titles and Varsity events. We lost some extremely talented players over the past two seasons, such as James Webb (England international), Will Barber, Timi Ol, Kelsey Francis and Darnell Humes (now at Birmingham, Superleague) which left us short in pre-season training and eagerly waiting for our trials. With our new look squad, we struggled initially due to a lack of understanding of our playing philosophy. We knew that other playing systems would get us faster results but we stuck with our values and after an extremely poor start, we saw the squad go on a long unbeaten run after Christmas and finish tied on league points with UoN. We’ve had our most talented intake of players this year and are extremely excited about our 4 first-year players (who are in the squad for Varsity). Greg Birch, (current Superleague player for Cambridge United) and Luke Butterfield, (Huddersfield Town EFL Futsal) have shown incredible progress already and will look to lead the club into the next few seasons. Away from the men’s sides, it is important to note that our women’s performance team have managed to go unbeaten all season and are set to return to BUCS Premier next season! What types of developments is NTU aiming to take to see Futsal strive at your University? Our social sessions have been a huge success once again thanks to the hard work of our committee. This is an area we are really eager to keep developing as a great and continuous source of both fans and new players who were unable to attend trials. We see this as the best tool to promote the sport across our university and to get more engaging fans. The next step in our development is to create more links with clubs around the world to continue the development of our performance scholars. We currently have great ties with ProFutsal London and SIMA Peligros from Granada, Spain. These ties create a pathway for our players post-university to continue competing at the highest level. How important do you feel the Varsity Futsal event for Futsal’s development and awareness is in Nottingham University life? Nottingham Varsity is one of the very few fixtures in the country which promotes what the final product of futsal should look like in the country: a showcase of excellent, young talented English players combined with some very knowledgeable international students, all with an unbeatable atmosphere. 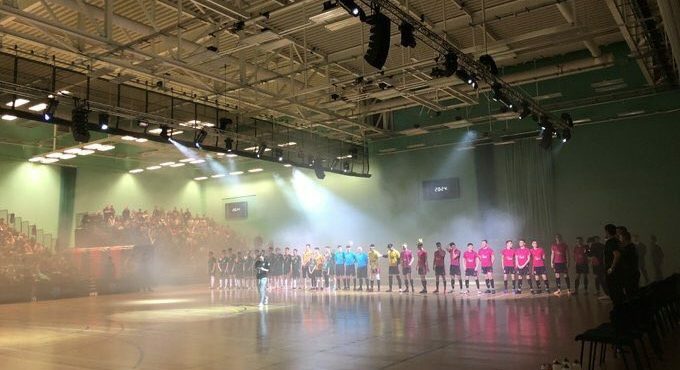 We hope that clubs from around the country see the potential of hosting large scale futsal fixtures and also get to see the incredible standard of players on show for both Nottingham teams. It is also a great showcase event to promote the sport across our university and to hopefully attract new students to join the university based on our performance futsal programme. What impact are both your clubs having for Futsal awareness outside of University life but in the city? 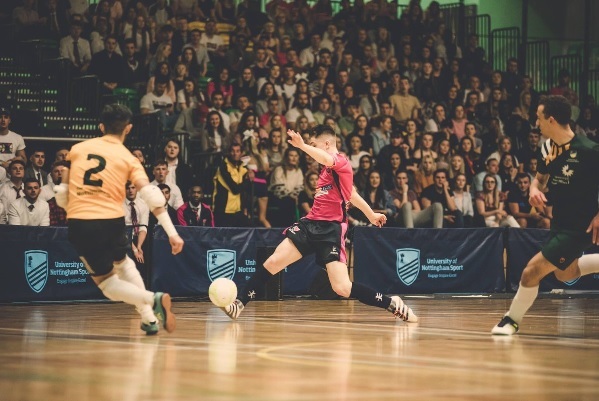 We have great admiration for the work that the UoN presidents have done for raising the awareness of futsal across the city, particularly what Dan Slater has done! They have a good youth academy which is great to see and their performances in the national league have helped with the credibility of university futsal across the country. At NTU, we are extremely proud that a lot of our former student-players from the performance or social programmes tend to stay living in Nottingham because of their futsal experience. This has allowed us to create a great fan base of non-students also due to their connections at work. In fact, we estimate that about half of our fans are either former players or people who have no connection to the club, which is great for us and something we want to develop even more. Where do you see NTU Futsal Club in 5 years’ time? University sport is a strange environment due to the constant flow of players. Whilst we’ve already managed to win multiple BUCS Premier titles, our short term aim is to win the Championship knockouts. As mentioned before, we have created some excellent links with clubs, so as a coach I would love nothing more than to see some of my players competing for those teams either in England or abroad at the highest level which I believe that this current group can definitely achieve. We’ve had a great interest in Cameron Riley (England u23s), Ollie Judd and Jordan Riley. Whilst these 3 have managed to achieve excellent grades in their degrees, I believe that they are more than capable of pursuing a futsal career. We often get asked about re-entering the national league system, which we continuously consider and always remains an option to pursue. Within the next 5 years, we’d love to see further links created with both local and global clubs and their academies; our players competing in the highest leagues post-university alongside excellent non-sporting careers; and also to continue expanding the Varsity event, always with the dream of it being hosted at an arena and being televised!